Most people have heard of Dr. Masaru Emoto’s experiments on water. After placing positive words, playing uplifting music, and sending prayers to glasses of water, it created beautiful crystals in the water. “If you want to find the secrets of the universe, think in terms of energy, frequency and vibration.” – Nikola Tesla. Science has beyond proven that everything is composed of frequencies. The air is made up of frequencies, the sounds we hear, the things we see, and even our own bodies are composed of frequencies. This being known, brings us to our next question? Can we be affected by sound frequencies in a way that we never imagined? I mean sure, everyone enjoys a good song, but could sound frequencies potentially affect us physically? We know that frequencies affect other frequencies by different demonstrations and experiments such as the science of Cymatics and Water Memory. 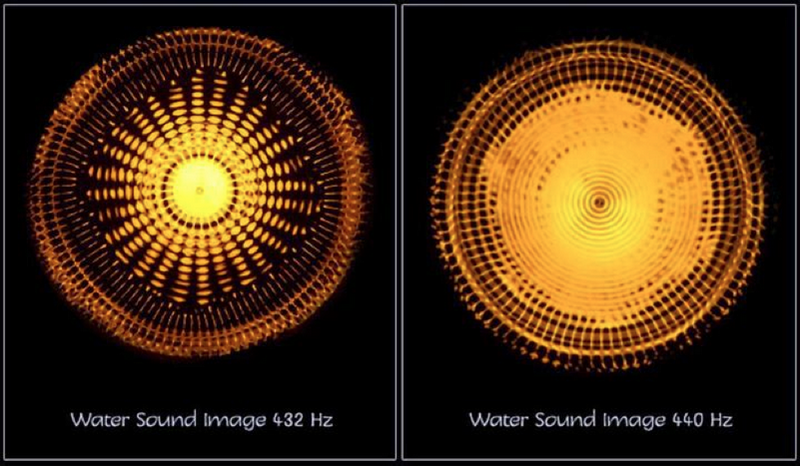 By using Cymatics, we have discovered that when sound frequencies move through a medium (air, water, sand), they directly affect the vibration of matter. You can see photos below that demonstrate how sound frequencies affect water. It is actually beautiful and stunning. Dr. Masaru Emoto has shown how our own intentions might even alter the material world by using water memory. He has shown how intentions through sound, emotions, and even thoughts can dramatically shape the way water crystallizes. So, the underlying question: can sound frequencies affect humans? It is believed that the sound frequency 432 Hz is consistent with the patterns of the universe. It is said that 432 Hz vibrates with the universe’s golden mean PHI and unifies the property of light, time, space, matter, gravity, and magnetism with biology, the DNA code, and even consciousness!